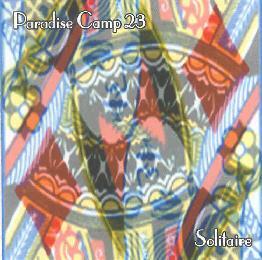 Paradise Camp 23 - "Solitaire" / "Teonanacatl: The Live Sound Of Paradise Camp 23"
Solitaire and Teonanacatl are the latest releases from psychedelic noise freakout project Paradise Camp 23, which is the trio of Erik Amlee on guitar, sitar, tapes and noise, Aleda Jonquil on electronics, effects and noise, and Nate Longcope on casio, video, electronics and noise. Solitaire consists of a single 46 minute track titled "Like A Duck In A Noose". The music is high intensity right out of the starting gate. Steamroller drones roam along the aural spacewaves as pulsating and bleeping alien electronics do their meteor shower dance. The drones form the foundation of the piece and the frenetic and continually developing electronics provide the color, character, and even give a sense of thematic development. After several minutes things get darker and even a bit eerie as strange voice samples are introduced and the volume and noise levels are kicked up a notch. The drones and space electronics are always at the forefront, though at various points we have screaming acid guitar solos, ripping theramin sounding waves and a varied sonic stew of cosmic shock therapy. It's an ultra cool blend of alien space, psychedelic freakout, noise and sound-art elements. Fans of Hal McGee, Mental Anguish, and a slew of other creative sound artists will love this. If you like totally freaked out exploratory cosmic craziness than step right this way, strap yourself in, and enjoy the ride. Those susceptible to motion sickness should proceed with caution. Teonanacatl gives us a glimpse into the live Paradise Camp 23 experience. The single 33 minute track is actually taken from 4 separate performances, and though firmly in the noise/space/psych/sound-art realm, Teonanacatl comes across as being far more atmospheric and purely psychedelic than Solitaire. 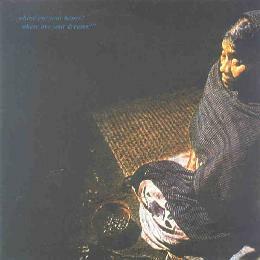 I love the industrial drone mass, swirling guitar patterns, and singing wolf and wind howls. Pulsating flying saucers hover overhead along with whining and crashing guitars, factory hums, psychedelic sitars, and plenty of space weirdness. Much of this is like an extended version of the little freakout bits that made Hawkwind's Space Ritual so special. Some of the guitar notes sound like Robert Fripp gone acid freakout. A totally spaced journey into that dimension where cosmic space and an ethereal brand of aggression coexist. I got completely lost in both of these discs. And yes, I actually listened to both in one sitting. Teonanacatl might be a better starting point for the uninitiated. But hell, they only want $8 each for them so I'd say there's enough difference between Solitaire and Teonanacatl it's worth taking the plunge and checking them both out.